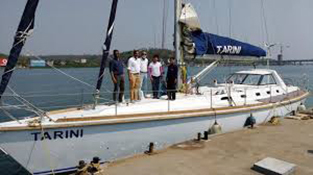 he Indian Navy’s second ocean going sailboat Tarini was inducted, in presence of host of dignitaries at a glittering ceremony at INS Mandovi Boat Pool. Admiral Sunil Lanba, Chief of Naval Staff along with other senior Naval Officers were also present on this historic occasion to wish the boat and her crew in their endeavors. The first all-women crew on board INSV Tarini will set sail in August this year to circumnavigate the globe. But for the people of Ganjam district, in Odisha the naming of the sailboat is an honour for the Tara-Tarini shrine and Odia maritime history. In Sanskrit, the word Tarini means both boat and saviour. Tara-Tarini was the traditional patron deity for sailors and merchants of ancient Kalinga, who worshipped it for safety and success at sea. Therefore, the boat draws her origin from the famous Tara-Tarini temple of Odisha. Even Tara-Tarini of Odisha is known to have historical linkages with the river Goddess Mhadei — the exclusive boat deity of Goa’s Mhadei river. Both the deities have sculptural similarities and similarities in their puja system. In order to promote ocean sailing activities and to encourage women empowerment, the Indian Navy conceptualized the idea of the First Indian All Women Circumnavigation of the Globe. A team of six women Officers led by Lieutenant Commander Vartika Joshi was selected for this project.